A method of silencing or blocking the function of a gene by introducing the short sequenced RNA resulting in transcriptional inhibition or no protein production. dsRNA: double stranded RNA or dsRNA is actively involves in RNAi. Complementary base pairings of two strands of single stranded RNA results in formation of dsRNA. It is present naturally in cells, long dsRNAs are derived from the events such as virus induction or just after the formation of dsRNA, the process of RNAi is initiated. Micro RNA: micro RNA or mi-RNAs are single stranded RNAs of short nucleotides (19-25 nt) which are present in all eukaryotes. These RNAs are encoded in host genome and then processed by the Dicer which is an endonuclease enzyme. Micro RNAs can block the activity of gene by destructing its homologus mRNA in animals and plants. They are often referred as small temporal rnas due to their importance in regulating the developmental timing. Shart hairpin RNAs: short hairpin RNAs or shRNAs are 19-29 nucleotides longer RNAs which are synthetically manufactured. They contain an antisense strand. Sense strand and spacer (i.e. small sequence of loop present between antisense and sense strands). Complementary sequences of antisense and sense strand results in formation of hairpin shaped dsRNA. a) helicase domain at N-terminal: its function is still unknown. b) c-terminal dsRBD (double stranded RNA binding domain): it binds the dsRNA but specific site of binding is not defined. c) Two RNase-III domain: involves in cleaving the strands of dsRNA, results in shortening of dsRNA. d) PAZ domain (piwi,argonaute,zwille): it involves in interacting with PAZ domain of RISC complex. RISC (RNA induced silencing complex): RISC is multiprotein-complex which involves in incorporation of single strand of siRNA. It has activity of ribonuclease with ability of cutting RNA. This mechanism is very important in regulation of gene by miRNAs and in defense system against the viral action as they used dsRNA as infectious vector. RISC consists of dicer, siRNA, argounate protein, PAZ domain and some other components. Only antisense strand is incorporated into RISC from double stranded siRNAs, this strand is selected by help of argounate protein which is RNase and is catalytically active. The sense strand is dedraded by RISC. 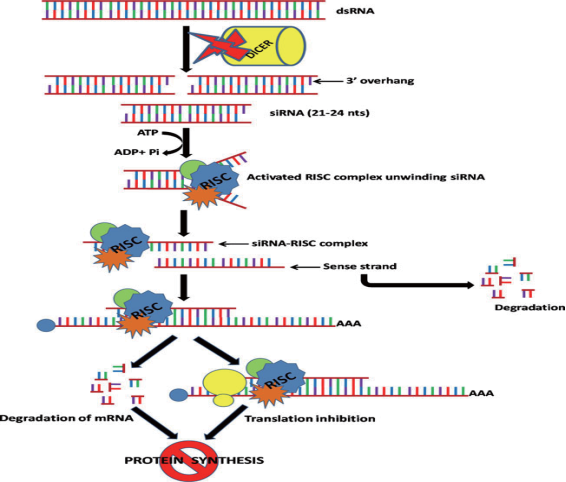 The RISC degraded the mRNA which is complementary to its siRNA results in repression of protein translation and effectively silencing the gene. RDRPS (RNA dependent RNA polymerase): RDRPS play vital role in RNAi and in PTGS (post transcriptional gene silencing) mechanisms. Initiator Step: just after the entry of dsRNA; through introduced transgene, an aberrant genetic material or viral infections, initiate the pathway of RNAi of the cells, resulting in activation of Dicer enzyme. dsRNA cleavage: dicer enzyme produced the fragments of small interfering RNA of about 20-25 nt long by cleaving the dsRNA. Effector step: RISC then differentiate between two siRNA fragmentseithe antisense or sense fragment. Sense fragments are then degraded by RISC. Integration of antisense fragment: antisense fragments are then integrated into RISC. They are used in targeting of complementary mRNA. mRNA silicing: After binding the complementary mRNA with siRNA, argounate protein of RISC performs the activity of “slicing” i.e. it cuts the mRNA, so the mRNA is blocked results in no production of protein. Transcriptomics, proteomics and metabolomics analysis. Altering the architecture of plant: Architecture of plant likes its height, elongation of stem, branching of roots, morphology of leaf and inflorescence are important for plant physiology, yield, biochemical process and its to resistance for environmental stresses. Bu now, plant architecture are modified by using technology of RNAi for improving the productivity of plants. e.g. RNAi decreased the expression of gene OsGA20ox2 in rice, this enzyme encodes GA 20-oxidase, involves in the synthesis of gibrellins (GAs) which are biologically active in the plants. so, transgenic plants with suppressed OsGA20ox2 produced low content of GA1, decreasing the height of plant, resulting the phenotype which is semi-dwarf. Semi-dwarf plants shows more productivity, shorter stems and resistant than wild plants. Tolerance against abiotic stresses: abiotic factors (temp, water, salinity etc) greatly affect the productivity of plants. now, it is discovered that RNAi is involved in plant responses against abiotic stresses. E.g. miR393 inhibit TIRI gene expression, which reduced the growth of seedling and signaling of auxin in abiotic stress and also play role in antibacterial resistance. Tolerance against biotic stresses: biotic factors (viruses, nematodes, fungi etc) contribute to the maximum loss of plant productivity especially viruses, and their control is also difficult. But antiviral activity of RNAi plays important there. E.g. papaya fruit plant which is a major source of enzyme papin is affected by the attack of viruses. Transgenic plants are produced which have gene of coat protein, resistance to attack of virus. Removal of allergens: hypersensitivity in response to normal harmless food due to role of IgE is known as food allergy. Some allergies due to food are very severe and even threatened for life. Food allergies must be avoided as there are no medicines for them. RNAi also plays an important role there. E.g. soybean is legume plant and is allergic due to Gly m Bd 30 K protein. Transgenic soybeans have been produced in which this gene is silenced, with no harms of allergy. Secondary metabolites enhancement: secondary metabolites of plants are major sources of pigments, drugs, food additives, fragrances and pesticides. RNAi technology is now used in order to silence the gene which decreases the production of secondary metabolites. E.g. through RNAi potato ptatins which reduces the production of potato tubers (efficient expression system of protein i.e. therapeutic glycoprotein) were eliminated. Flower scent and color modulation: horticultural trait such as scent and color of plants contribute to economic as well as aesthetic value. Garden plant flower color was modulated by using the technique of RNAi against CHs (chalcon synthase) gene. Male sterile plants development: to ensure purity male sterility is very important in breeding. It act as an alternative process for producing hybrids when naturally male sterility is absent. Nutritionally improved plants: RNAu technology is being used to produced plants with optimized nutrients (such as flavonids, vitamins, antioxidants, amino acids, fatty acids etc) in order to produced biofortified crops. e.g. by using technology of RNAi transgenic plants of Brassica napus were produced in which sinapate esters level in seeds were minimized upto 75% by blocking sinapateglucosyltransferase: UDP-Glc gene. Development of seedless fruits: character of seedless fruits is greatly appreciated for their freshly consumption and also for processing the fruit products. It increase the quality of food as hard seeds gave bad taste. RNAi technology is now used for production of seedless fruits (especially watermelon, guava tomato and apples). e.g. by using RNAi seedless tomatoes are produced by suppressing the ARF7 gene. Toxic compounds removal: almost all plants contain different types of toxins which causes hindrance during process of pure product extraction. RNAi technology is very powerful for producing toxin free plants. e.g. For production of “tearless onion” production of a ‘lachrymatory factor synthase’ gene was reduced. Efficient: 70-100% of transgenic plants exhibit silencing phenotype. Precise: no side effects were reported. User friendly: RNAi in plants is performed by using many “user friendly tools”. Flexible: with only a single constructs multiple genes could be silenced. High throughput: vectors for making hpRNAi constructs are design for high throughput. Stable: hpRNAi shows the stable inheritance among the number of generations. Better than anti-sense: duplex RNAi silencing is better than either anti-sense or sense silencing. "RNA interference (RNAi) for Crops." UKEssays.com. 11 2018. All Answers Ltd. 04 2019 <https://www.ukessays.com/essays/biology/rna-interference-rnai-crops-5907.php?vref=1>. "RNA interference (RNAi) for Crops." All Answers Ltd. ukessays.com, November 2018. Web. 20 April 2019. <https://www.ukessays.com/essays/biology/rna-interference-rnai-crops-5907.php?vref=1>. UKEssays. November 2018. RNA interference (RNAi) for Crops. [online]. Available from: https://www.ukessays.com/essays/biology/rna-interference-rnai-crops-5907.php?vref=1 [Accessed 20 April 2019]. UKEssays. RNA interference (RNAi) for Crops [Internet]. November 2018. [Accessed 20 April 2019]; Available from: https://www.ukessays.com/essays/biology/rna-interference-rnai-crops-5907.php?vref=1.